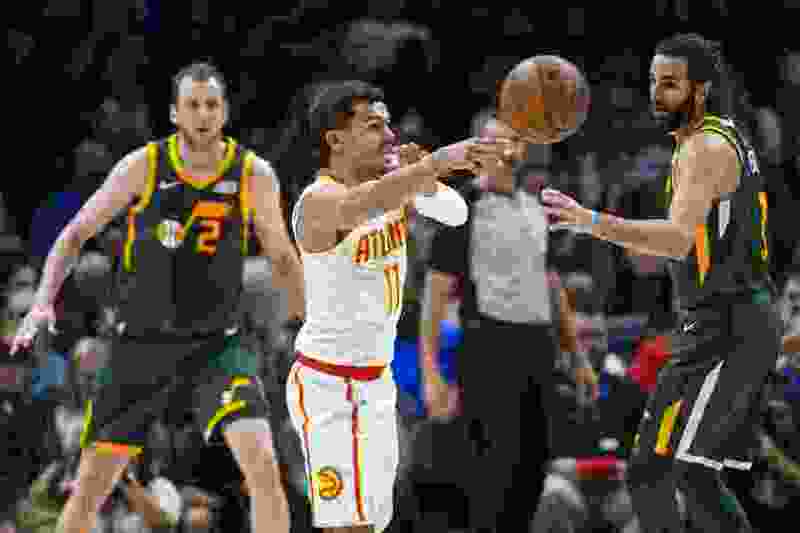 Atlanta • It’s not that Trae Young and Donovan Mitchell have very similar games: one is an any-distance sharpshooter, with a passing game that belies his age. The other, a scoring wizard with a set of tricks deeper than a Las Vegas magician’s. But there is a similarity in this: both started their rookie years relatively slowly, before taking the world by storm in the latter portions of their first season. Pierce’s memory isn’t perfect, but close: Mitchell was 3-of-21 in that November game against the Sixers. “He got 21 shots up, and that’s a skill and a mentality and a talent. I said ‘That kid’s going to be all right.’" Pierce saw the same thing Jazz head coach Quin Snyder did: Snyder started him in the very next game, despite the shooting struggles. Jazz fans know the rest: Mitchell excelled for much of the rest of the year, including the playoffs. Young’s story is the same: he had a miserable November in which he shot just 35 percent from the field and 19 percent from 3 — his most NBA-ready talent, according to scouts. But he has turned it around since the start of the new year, averaging 21.4 points and 8.3 assists per contest, on much better 43 percent shooting from the field and 38 percent from deep. Young showed that on Thursday night against the Jazz, scoring 23 and dishing out 11 assists. It’s his 14th 20 point/10 assist game of the season, which is the most of any Hawks player in a season since 1968. And unexpectedly, just like Mitchell, he’s made the Rookie of the Year contest a race. It still very much looks likely to go to Dallas sensation Luka Doncic, who has even outscored Young during this stretch. But Atlanta’s team cohesion and overall feistiness has greatly improved, and gotten them some shocking wins. “It’s very important to me to finish out strong. I know it is for everybody in this locker room. We all want to go out strong, maybe spoil some teams along the way, and just have some fun," Young said.